Mt. Nebo, highest peak in the Wasatch at 11,928'. I'm not sure how anybody can drive past this mountain without wanting for it's summit. It is one of the most dominating features of the Utah Landscape that I can think of. 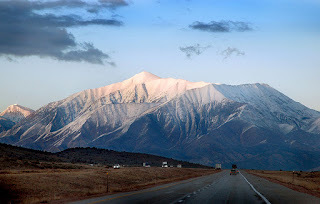 It has been on my list since at least 2001 when I first drove past it on I-15, enroute from Escalante to SLC. Lisa and I drove from SLC the night before and camped so we could get an early start. We still didn't get started until nearly 8am, but it was early enough to beat everyone else. We had a camp, that was more of a bivouac with a bunch of cows, at the foot of North Peak. Soon enough we got above the cows. We had lots of flowers in bloom, and beautiful weather, albeit a bit hazy. We made the 4.5 miles to the summit in 3 hours and had it all to ourselves for over an hour. mick + lisa = hiking machines. Thanks for the motivational nudge. Several years ago I only went to the south summit. Your posting will hopefully renew my uncompleted journey.